This recently completed modern complex offers several one bedroom apartments for long term rental. Each unit is fully furnished and equipped for an extended stay. 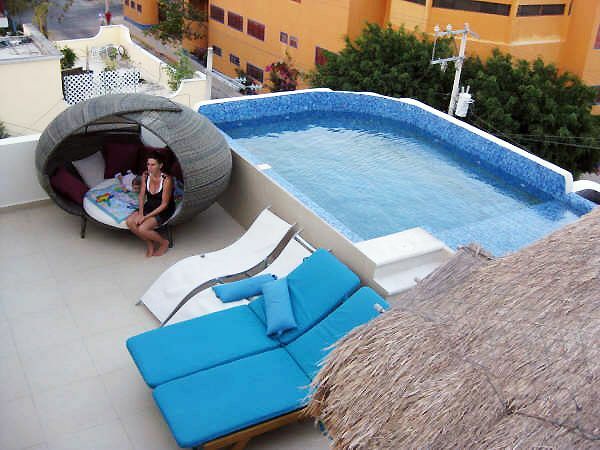 Guests will love the rooftop sundeck with outdoor kitchen and plunge pool. The complex is located in a popular and safe neighborhood about 9 minutes walking to the beach and close to a major grocery store and produce market. The owner of the complex lives on-site ensuring that the building is perfectly maintained at all times. That’s gorgeous! I hope I’ll be able to visit there soon, I’ve heard so many great things about it. Rob, we might be interested in renting this for a month. Is EVERYTHING really inclueded in that 750dollars in month? Electric, water, maintenances? The rates and inclusions vary from unit to unit in this building. Right now there are no vacancies. There is a large one bedroom opening up on Jan 31st for $780 usd/month plus electricity. Internet, water and maintenance are included. Please let me know if you are interested in reserving. we are presently in merida til after carnival feb. 19 . we are looking for an apartment or suite in the area for a month basicly from feb 19th to mar.19th.any help would be greatly appreciated. Michele you are the best! Just rented this condo not ever seeing it for 1 yr but I have booked with Michele before and she is true to her word. Can't wait to get back to PLAYA!